How is the Coda formula language similar? How is the Coda formula language different? How can I streamline a long set of IF statements? 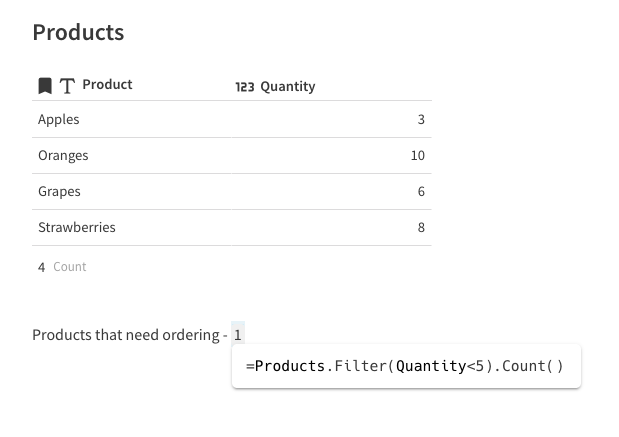 What formulas does Coda offer? 1) Math - You can perform math functions just like you're used to in Coda. 2) IF Statements - If you have different results you want to see based on a value, you can use your tried and true IF set up. = IF (4>2, "Woo hoo! ", "Nope, no chance")→ Woo hoo! 3) Time - You can aslo call up time just liket you're used to. In your traditional spreadsheet program, you perform formulas based on cell coordinates. For example, (A1:A31)/(B1:B31). While accurate, formulas like this don't grow with you. What happens when you have an A32 and B32? The margin of error gets a lot bigger, and you already have enough on your plate. You shouldn't have to wrestle with formula adjustments over time. To combat this problem, Coda's formula language abandons cell coordinates and uses the actual objects' names instead. For example, in our example (A1:A32)/(B1:B31), if column A held all of our Produce, and column B held all of our Prices, the Coda formula would simply be Produce/Price. That way, as our columns expand, so will our formulas. So, when you're working in Coda simply use the table, column, and row names when making calculations, and you're formulas will grow along with you. A familiar sight in a traditional spreadsheet is a line of parenthesis at the end of a formula )))))))). This makes it hard to parse what's actually happening in the formula. To make it easier to track (and write!) your formulas, Coda uses chaining.